My son was having lots of stomach problems and we ended up using this and they went away. The formula smells bad and it's expensive but he loves it and his stomach problems have gone away. He's four months now, been using for two months and will probably use until 6 months. So happy the ped recommend us trying this! Okay so first of all, this stuff smells HORRIBLE. It smells like a cheez-it that has been soaked in water and left in a very hot humid car for hours on end. It clumps constantly and doesn't mix easily. BUT IT WAS A LIFESAVER. My daughter had negative reactions to breast milk (even with dietary changes), and all other types of formula. She had to be on medication just to get her acid to stop long enough to eat. Nutramigen decreased her gassy tummy and spit up. 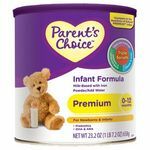 We used it up until their Toddler version and would recommend to others who are struggling finding a tummy friendly allergen friendly formula. It smells so bad but it must taste pretty good because my daughter drank it until she was 2 with no complaints or refusals. 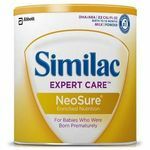 My pediatrician and I went through several different types of formula and even tried breast feeding my baby but none of them seemed to work. Some would constipate him, others would make his bowels too loose, some he wouldn't be able to keep down. I was beginning to think that we would never find one that would work until we gave nutramigen a try. He had normal regular bowel movements and his colic symptoms lessened. When my son was born we had to go through a ton of formulas to find something that worked for him. This formula was okay he didn't do the worst on it but it was still pretty bad it smelt horribale and never wanted to mix together, it was aggravating trying to get it to mix. Other then the mix and smell, he was still super colicky so all together this formula wasn't a fix for my son but we did find something that worked from the same brand. We tried numerous formulas with my son in an attempt to reduce his symptoms of acid reflux and the non stop crying it brought on. After trying a variety of different types and brands, our pediatrician recommended Nutramigen out of shear curiosity that all of his problems might potentially be from a milk protein allergy. She was spot on with her diagnoses. The first couple of weeks on Nutramigen we noticed a lot of mucus in his diapers, which I was told by the company themselves was normal as the dairy flushed from his system. By the end of that two weeks his reflux ha drastically improved and even the eczema that had plagued him since birth was starting to clear up. My son was happier, I was happier and life got a whole lot easier with him thanks to Nutramigen. I'm not sure what I would have even done had it not been suggested to me because I didn't even know it existed until then. After seeing such a huge change I regretted it taking so many months to find something that would work. 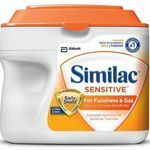 I've since recommended it to many moms experience similar problems as I did with my son because I loved the product so much. Ease of Preparation Harder to get mixed with shaking than other formulas. Had a tendency to stay clumped. We discovered my son had an allergy to the protein in cow's milk when he was six weeks old. 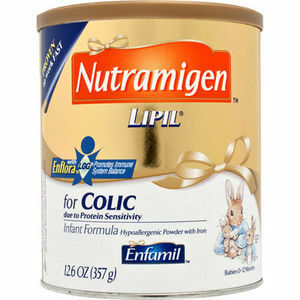 Our pediatrician told us that the only formula we could give him was Nutramigen made by Enfamil. Once we started him on it, he started gaining weight like he was supposed to. I'm very glad there is an option for this health issue. That being said, I hate this formula. I know that it is all we can use so I have had to make my peace with it, but it smells terrible and is very expensive. You have to use way more powder than traditional formula, and it doesn't mix into the water very well at all...you have to really shake it a lot, which makes lots of bubbles. The powder is very fine so it makes a mess. However, my son doesn't seem to mind the taste (apparently it is bitter) and he digests it very well. I am glad there is an option like this for babies who can't digest regular formula. 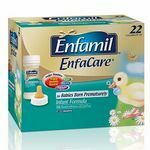 Enfamil does offer a rebate program to help defray the cost. 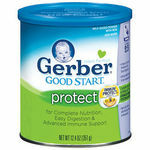 great for babies with milk allergy! My youngest daughter has an allergy to the protein in cows milk. We tried 3 different formulas before her doctor put her on this. Before she was staying up all night fussing. Crying all night. During the first 24 hours I noticed a huge difference. She stopped crying and didn't act like she was hungry all the time. I love the fact she was being a newborn baby. She did poop a lot during the first 24 hours, but after that everything went to normal. The powder mixes well and didn't clump up. The formula lasts long on her stomach and she is functionally normally. The smell isn't so stinky that you have hold your breath when making it. The aftermath of the digestive process doesn't stink too much either. The poop is different than the others, but it is normal. Burping her is no problem now either. She sometimes burps herself. The taste must be ok because my daughter loves to eat. I am so happy that this formula was made. I would recommend this product to anyone who has a child with colic, milk allergy, and problems with constipation. Many moms have babies who spit up. It is pretty normal in my experience, however, when a baby vomits across the room something is wrong. Every once in a while a baby will have some trouble digesting their food and may spit some of it back up but it should not be the entire feeding. One of my sons was having trouble keeping his formula down. Every meal he had came right back up and I was worried about his health. We switched to Nutramigen from the advice of our doctor who explained that it was already partially digested so it may stay down easier than the current formula. It was worth a try. When I bought the formula the one thing that I noticed right away was the cost. It was more expensive than the current formula we were using. The second thing I noticed right away was the smell. It smelled pretty bad. I wasn't sure I wanted to give it to my baby. However, I tried it and he ate it without issue after a couple feedings. The best part was that they vomiting slowed way down and eventually ceased completely. At twelve months we tried him on regular cows milk and he did fine. I am very happy with the results of this formula and would highly recommend it. All three of my children had milk allergy problems and I was breast feeding but also needed to supplement. Nutramigen was the only formula I found gentle enough for their sensitive tummies. Easily Digested When my babies had problems with regular formula, the doctor suggested Nutramigen because the milk proteins were broken down and more easily digested by a baby, especially one with milk sensitivities. I used this formula, after trying about 10 other brands, but ended up going back the this one; it was the only one that worked! Ease of Preparation This formula does have a strange smell, and it is rather hard to mix. No matter how many times you shake it in a bottle, you'll still have clumps of formula floating around. The best way we found, was to mix it in a separate container. But you do have to VIGOROUSLY shake to get it well blended. Also be sure to only use "cool" water. If you use warm water, its suppose to break down some of the nutrients (the same way you're not suppose to heat up breast milk in the microwave) Just read the side of the can for details. We had a lot of feeding issues with our daughter and tried this for a period of time. We found that it really did help to settle her stomach, but we had a hard time getting her to drink it because of the taste. Luckily, we were able to get some other things under control so we could transititon off of this. You will pay more for this, but it is a good brand and does work.